Pack this Eau Fraiche men's travel set in your bag and apply it during your journey for a refreshing fragrance. Featuring notes of lemon, musk, and amber, this fragrance set gives you an air of sophistication. 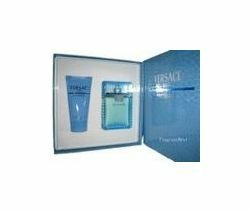 1.7 oz Eau de Toilette Spray 3.4 oz Shower Gel Fragrance Notes: Lemon, Rosewood, Carambola, Cedar leaves, Tarragon, Sage, Musk, Amber, Sycamore wood Main accords: citrus, aromatic, woody, fresh spicy, fruity, green Design house: Versace Scent name: Eau Fraiche Gender: Men Launch date: 2006 Product dimensions: 4.5 x 3.9 x 8 inches Launch Year: 2006The content on this site is not intended to substitute for the advice of a qualified physician, pharmacist, or other licensed health-care professional. The products may have additional information and instructions on or inside the packaging that you should carefully read and follow. Contact your health-care provider immediately if you suspect that you have a medical problem. This product may not have been evaluated by the Food and Drug Administration and is not intended to diagnose, treat, cure, or prevent any disease or health condition. Due to the personal nature of this product we do not accept returns. We cannot accept returns on this product. If you have any questions about this product by Gianni Versace, contact us by completing and submitting the form below. If you are looking for a specif part number, please include it with your message.